Best Coyote Hunting Lights of 2019 - Do NOT Buy Before Reading This! The Orion M30C is one of the best hunting light available on the market. It comes with multiple brightness options to suit your needs. You can choose between them when scouting for the coyote or when closing in on your targets. The unfiltered red light of M30C is also an excellent add-on for your nightly hunting excursions because it effectively gives you visibility without scaring away the coyote. 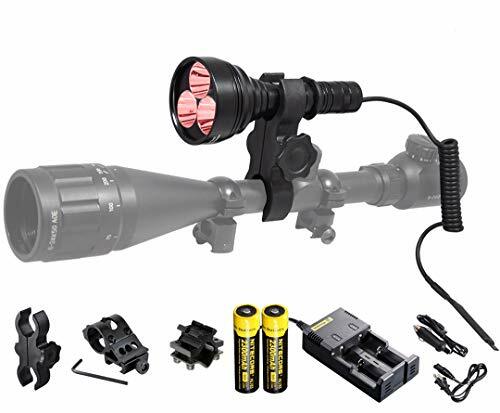 The light comes with a full package of rifle mounting kit. This means that you can quickly and easily mount this light to rifle, scope or rail using purpose-specific mount kits. It also comes with a push button switch as well as a remote pressure switch, so that you can easily and quickly turn on the light in a blink. The spotlight has a fairly long range and can emit a powerful 700 LED lumens over a distance of around 377 yards. The power source for the spotlight comprises of high performance rechargeable batteries. The light ships with two sets of these batteries as well as a smart charge. You can use AC power source or even plug the charge into the car power adapter and recharge the batteries to full. The adapter automatically stops charging once the batteries are fully charged. The Nitecore P30 is specifically manufactured for night-time visibility over longer distances. It packs a powerful light emitter which can throw 1000 Lumens of light over 676 yards. This means that you get to have an exceptional visibility over an extraordinary range of distance when hunting coyotes. P30 comes with five brightness options which you can tweak depending on your exact needs. It ships with dual red and green filters. 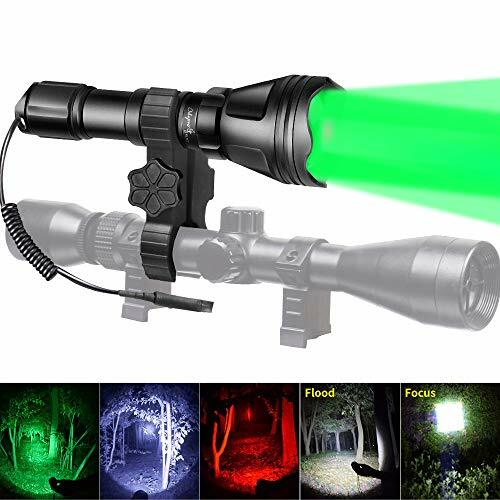 Both have their advantages when used in the night and you can experiment with both to see which works better when scoping in the dark or during actual hunting. The pressure switch makes sure that you turn on the light at the exact moment you need visibility. This spotlight also comes with a high clearance mount for rifle attachment. 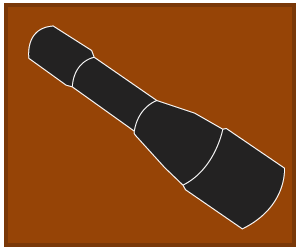 Mount it once to your rifle and your hands are free to use the rifle or carry other objects as required. The complete package also includes an offset mount which can be used to mount this spotlight to an accessory. The power source for this spotlight comprises of an 18650 battery which can be recharged using the i2 smart charger that also ships with the kit. 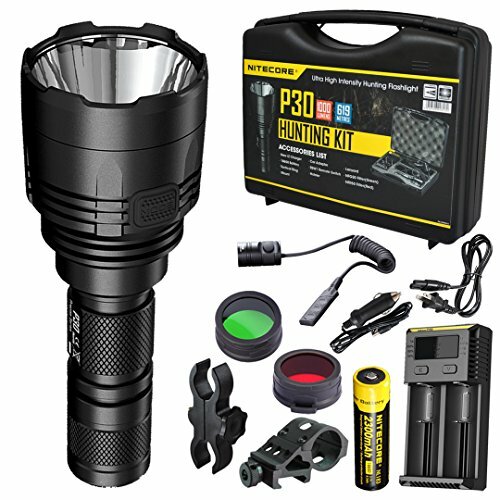 In all, the P30 features a rugged design and a powerful light profile which makes it perfect for your nightly outdoor hunting excursions. The Odepro KL52Plus is a hunting flashlight that also serves as a floodlight. You can use it as a flashlight to specifically focus on coyotes or you can zoom in to turn it into a floodlight and get a wider area of illumination. This helps you survey the area and search for coyotes with a broader range of visibility. The KL52Plus comes with four color options. You can quickly switch between different colors, depending upon your needs. The color options include red, white, green and IR850nm light. Each is specifically suited for various purposes such as surveying the area, locating the targets and then focusing on these targets. The color modules are quick and easy to load and unload. The full kit also comes with multiple mounts which enable you to mount the light directly to your rifle or an accessory such as the scope. The scope mount features a quick-release design and is perfectly suited for use with multiple scope sizes. The overall body of the flashlight is constructed from rugged, aircraft-grade aluminum. As a result, the flashlight is weather and water-resistant. It is also shock-resistant so that if you drop it accidentally, you don’t have to worry about damaging it. In all, the Odepro KL52Plus is perfectly suited for use in all-weather conditions and a must-have for all your coyote-hunting needs. The Coyote Reaper light is another excellent product that perfectly suits night coyote hunting needs. This spotlight comes with a powerful beam that can illuminate up to 500 yards to let you scope, spot and target coyotes effectively. Coyote Reaper features a 2-color module. You can switch between red and green LED light depending on your hunting needs. Switching between the two is quick and easy so that you can do it in real-time. The Reaper has an adjustable focus which lets you control the intensity of the light and customize the illumination. It also comes with a built-in Halo shield. The overall body of the spotlight has a matte black finish which ensures that it blends in perfectly with the landscape and doesn’t alert the predators to your presence. The hunting light comes with a remote switch tail cap. The tail cap lets you turn on or off the light without any delays and without making any noise. The kit also comes with a picatinny rail mount to suit most rifles as well as scope tube mounts for two sizes, namely 1 inch and 30 mm. The power source for the Reaper comprises of rechargeable 18-650 lithium-ion batteries. You need only one of these to fuel up the Reaper but two batteries but you can also use the two together with a battery extension for double burn time. A wall and vehicle charger set lets you charge these batteries at home or on the go. This hunting flashlight from Ulako is a fairly basic unit that delivers great performance on the field. It packs all the essential features to help you achieve visibility and accuracy when hunting coyote in the dark. You can switch between spotlight and flashlight modes, depending on your needs. The spotlight focuses a square beam of light on a focus area, letting you keep track of coyote once you have spotted them. The floodlight, in contrast, offers a more rounded beam for a wider range of visibility and is particularly useful when you are searching the predators. The light features a single-mode green color which can powerfully illuminate up to 300 yards of distance. It ships with quick-release mounts for rifles as well as for various sizes of scopes ranging from 25mm to 30mm. The Ulako Green light features a sturdy and rugged built overall. It is constructed from high quality aluminum alloy material and is fully waterproof and shockproof. This makes it an all-weather companion for your coyote hunting during nights. The power source comprises of a single 18650 battery that ships with the light and functions for more than 4 hours on a single charge. A charger ships with the package to let you quickly recharge the battery. The length of a hunting light is directly related to its weight in most cases. So the longer the hunting light is, the greater is its weight. In some cases, however, the use of aluminum and other light-weight material may allow for longer hunting lights without increasing their weight. However, a longer hunting light is less compact, harder to carry and may not sit very conveniently when sitting on a rifle or a scope. When you are hunting coyotes, you are already carrying a rifle that is fairly heavy. Add to it a heavier hunting light and you may have a hard time carrying the full package for long hours. So it is preferable to look for a quality hunting light that delivers all the essential features in a light-weight profile. It is also important to consider the portability of the hunting light. Look for a model which is easy to carry around on or off the mount. The color emitted by your hunting light is an incredibly important factor when you are using it in the dark to hunt coyotes. Coyotes can see really well in the dark, but they don’t pay much attention red or green specters. This makes the red or green color an ideal color for hunting light. Many hunting lights feature one of these colors, or both of them. Some come with multiple color modules so that you can switch between. It is highly advisable that you go with a hunting light that comes with dual colors or multiple color modules. This gives you the option of switching to a light color that perfectly suits your hunting needs at a given moment. You need a hunting light to be bright enough to illuminate a few hundred yards in front of you. In the case of rifle mounted light or headlamps, this means that the brightness should be in the neighborhood of 300 lumens. Handheld lights, on the other hand, are bright enough even when they are using only 150 lumens. Hunting light vary a great deal when it comes with their lighting range. Some will illuminate as little as 200 yards whereas others will let you achieve visibility over 700 yards and more. It really depends on your preferences and requirements. If you want to be able to scope, spot and hunt over long distances, you should go with a light that has a longer range. If you are using another handheld source of light, you can do well with even a limited-range hunting light. Battery type and life is one of the most important considerations when choosing the right hunting light. A smaller battery will give you a limited run-time but it is light-weight at the same time. A larger battery offers longer run-time but has a more weighty profile. Handheld lights usually offer a longer battery run-time compared to mountable lights and headlamps. Most hunting lights come with a single-mode brightness that lets you achieve a specific degree of illumination. This is useful but not often sufficient for the night hunting needs. So you should prefer a hunting light that comes with adjustable brightness options. This allows you increase or decrease the amount of brightness depending on your hunting needs. 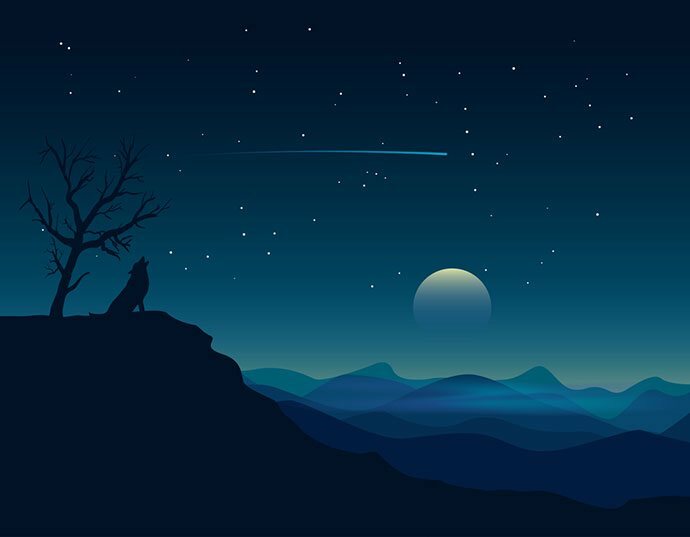 For instance, if you are looking at the coyotes from a distance, you need a brighter beam of light whereas when you are up close, you can work with as little as a few lumens. Adjustable brightness lets you tweak and customize the lumens to your exact needs. 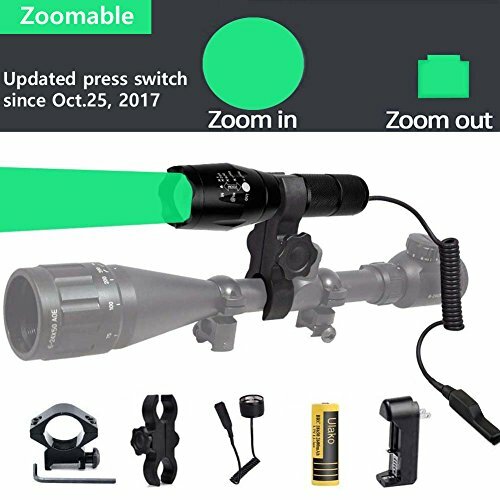 Adjustable focus allows you to zoom in or out of a hunting light. When you zoom in, the light essentially becomes a flashlight and throws a concentrated beam in the direction you choose. When you zoom out, the hunting light becomes a bright flood light and illuminates a wider range of area. Flood light is useful when you are searching for coyotes in a wide area whereas flashlight is perfect when you have already spotted the general location of the coyotes and now want to focus them. Many hunting lights offer both modes and it is preferable that you go with one that comes with both of them. Hunting light comes in a variety of types. The most notable among them include handheld light, rifle mountable lights and headlamps. Handheld lights offer the greatest variety of options. They have the most powerful light output and can last the longest. They are also quite inexpensive compared to other types. However, handheld lights are useful only when you have a partner who can hold the light while you operate the rifle. If you hunt alone, using a handheld light and rifle at the same time can be quite a hassle. Rifle mountable hunting lights can be mounted on top of your rifle and used with rifle scopes. These are a fairly popular type of hunting light because they allow you to use the light and rifle at the same time. This enables you to gain visibility and target coyote simultaneously. Rifle mountable lights are generally light-weight. A notable drawback, however, is that they drain battery life quickly and need to be recharged fairly soon. A headlamp is worn as a part of a helmet-like headgear. This lets you illuminate the area and spot the targets while freeing your hands for using a rifle or another weapon. The downside is that the headlamp does not let you target they light very effectively. At the same time, the battery of a headlamp drains fairly quickly so that you can’t use it for as long as handheld hunting lights. Hunting coyote at night is a very real challenge. These predators can look very keenly in the dark whereas the human eye is not as adept for viewing in the dark. This is why a quality hunting light is a must-have when you are hunting coyote at night. In addition to making hunting easier, it also lets you ensure your own safety when hunting coyotes. The right hunting light for you depends on your exact preferences and requirements. As mentioned above, there are a wide range of factors to consider when choosing the right coyote hunting light. Some offer multiple brightness options and adjustable focus whereas others are single-focus. Similarly, some lights come with various color modules while others may feature only a red or green module. The right fit for you depends on various questions: do you hunt alone or with a partner? Do you value a light-weight light more or do you want longer battery run-time? Are you going to need long-range illumination or a medium-range illumination? These factors determine the best coyote hunting lights for you.